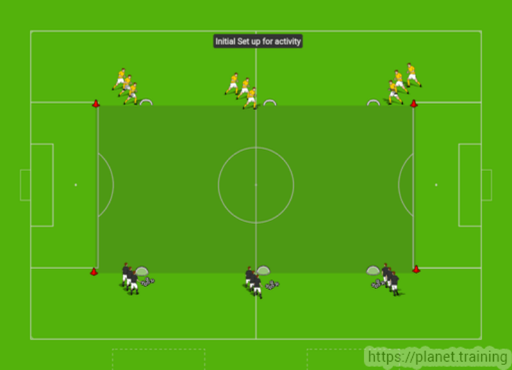 The objective of this activity is for defenders to shape very quickly to protect the goal as the offense moves the ball from place to place on the field. 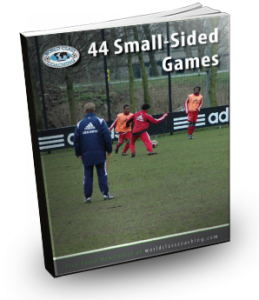 Area Size: Three cone or mini goals are set up on each end line of a 25 X 35-yard field. Players line up with half on each end line ready to come on as a 3 vs. 3 group to attack or defend. 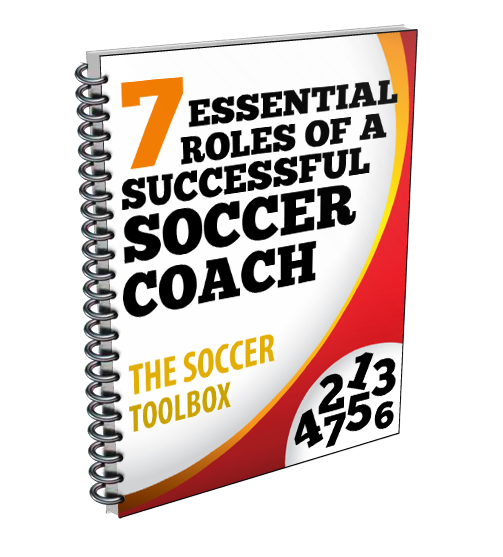 Objective: The objective of this activity is for defenders to shape very quickly to protect the goal as the offense moves the ball from place to place on the field. Coaching feedback should be exclusively given on defensive shape. Verbal cues of TRIANGLE when ball is in the center of the field and ARC when the ball is on the flanks is key to this training activity. One team serves from the end line and immediately moves out to defend. The other group of three move the ball and attempt to score on any of the three goals at the opposite end line. If a turnover occurs, the serving team attempts to score on their three goals. When the ball goes out of play, reset and start over with a new group. If the ball is served to the central attacker, then the defending group must make a triangle with pressure and cover. If served to the flank attackers, the defenders should defend in an L or arc shape as shown in the diagram. Ball always served from one end and then switch after ten balls. Can become a transition game when the ball goes over the end line, the attacking team begins to defend the new group coming onto the field from the end line.